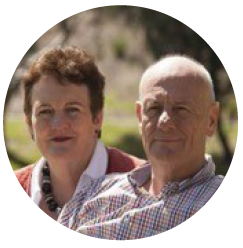 We are pleased to present Tim and Merridie Costello for our tour guides for the Steps of Paul 2019. Rev Tim Costello is a well known Christian in the public arena. He’s a Baptist minister now working as Chief Advocate for World Vision Australia. Merridie has been a Pastor with Tim in their days leading St Kilda Baptist. She has also been a School Chaplain. They share a love of history, theology, and good stories. He’s big-picture, she’s good on detail. They promise you a tour you’ll relish. Our group flights with Qatar Airways are booked to depart Melbourne or Sydney (other cities are available on request) to Doha with a connecting flight to Athens. See the FAQs section for exact flight times. Upon arrival into Athens we will be met by our local representative and transferred to our accommodation where we will spend the night. After checking in to the hotel, the rest of the afternoon is free to relax or explore, before a short briefing meeting at 6.00pm followed by dinner at the hotel. Our hotel has a spectacular view of the Parthenon from the rooftop. A group time will be facilitated by Tim and Merridie reflecting on the significance of Good Friday in the morning. The rest of the day will be free to enjoy at our leisure. Dinner tonight is at the hotel. After an early breakfast, we board our coach at 8.00am to start our excursion out of Athens. We'll drive along the coastal highway of the Saronic Gulf and reach the historic Corinth Canal for a brief stop for photos and refreshments. We will then visit the ancient site of Corinth and the nearby small archaeological museum where we will share time for devotions. On our way back to Athens we will visit a pottery and marble shop and enjoy lunch at a local restaurant (own expense). The remainder of the afternoon will be free to explore. Dinner will be at the hotel at 7.00pm. He is Risen! This morning we will farewell Athens with a climb up the marble capped Acropolis Hill to see the Parthenon and Erechtheion Temples. We will then walk to nearby Mars Hill where Paul delivered his well-known sermon about “the Unknown God” (Acts 17:23) and share in Easter Day devotions. 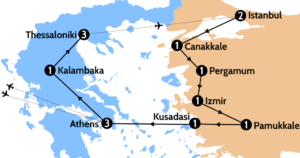 We will then depart for Northern Greece and drive to Kalambaka. Arriving late in the afternoon, we will check-in at the hotel for dinner and overnight stay. Today we enjoy a spectacular drive up to the Meteora Monasteries. After visiting a workshop where icons are made, we will have a short lunch break (own expense). We then drive to Thessaloniki passing through Veria (known biblically as Berea Acts 17:10) where we will have a 15 minute group devotion. We'll continue on to Thessaloniki arriving in the late afternoon where we'll check-in at the hotel, followed by dinner and overnight stay. Breakfast at the hotel. Enjoy the day at your leisure. We depart from Thessaloniki this morning and drive to Philippi to visit the site and baptistery of Lydia. We’ll have a 15 minute devotional by the river. Following a lunch break and some free time in Kavala, we return to Thessaloniki to have dinner and an overnight stay at the hotel. After breakfast at the hotel, we'll transfer to the airport in Thessaloniki for our morning flight to Istanbul departing at 9:30am. Upon arrival to Istanbul, we will be met by our local guide and transferred to the accommodation for check in. The day will be free time, followed by dinner and an overnight stay. We will visit Aghia Sophia, Blue Mosque and Hippodrome Square in the morning. The afternoon is free time to perhaps shop at the Grand Covered bazaar, or go on a boat ride on the Bosphorus River. We will return to the hotel for dinner and an overnight stay. After breakfast and check-out at the hotel, we leave Istanbul to travel to Gallipoli National Park at Eceabat and visit several sites from the Gallipoli campaign. We will spend time for reflection and devotions at the ANZAC Memorial. We will continue on to Eceabat to board a ferry across the Dardanelles to Canakkale where we will have dinner and an overnight stay. After breakfast and hotel check-out, we will travel to see the ancient ruins of Alexandrian Troas where Paul passed through on his second missionary journey (Acts 16:9). We will enjoy a coffee break at Assos (Acts 20:13-14), overlooking the port. We will then continue our journey towards Bergama (Revelation 2:12-17) also known as Pergamum, for a lunch break and devotion. We will see the Red Basilica and visit the Acropolis before check in at the hotel for dinner and overnight stay. After breakfast we will visit the Acropolis of Pergamum as well as the ancient healing centre of Asclepeios. Our lunch break will be in Akhisar before we drive to Thyatira, the 4th of Seven Churches, visited by Paul (Acts 19:10). We will continue on our way to Smyrna (Izmir) to visit the Church of St Polycarp. We will check in at our hotel in Izmir for dinner and an overnight stay. After breakfast we will drive to Sardis, where we will see the ruins of Artemis Temple, the impressive Roman gymnasium and one of the largest synagogues ever excavated. After free time for lunch we will make our way to Philadelphia for another short stop. We will continue our journey to Laodicea for a site visit. Our last stop is in Pamukkale. Time permitting we will visit the Ancient Hierapolis and the Calcium Terraces (White Castle). We'll then check-in to the hotel for dinner and an overnight stay. This morning we depart for Selcuk where we visit the St. John Basilica and the ancient city of Ephesus. Here we'll see the Baths of Scholastica, Temple of Hadrian, the library and the Great Theatre. After a lunch break, we continue our tour to Temple of Artemis before our check-in at hotel in Kusadasi. We'll have an early breakfast at the hotel in time to depart for our 7.00am ferry. We'll bid farewell to our Turkish guide as we depart Turkey. After customs formalities, we will board our ferry for a relaxing journey to the Greek Island of Patmos. Upon arrival at the port (Skala), our luggage will be transferred to the hotel by mini-van while the group will board the bus for the visit to St John Monastery and the Cave of Apocalypse. After the tour, we will have lunch at a local restaurant followed by free time. We will then reconvene for a late dinner at 9pm at a local restaurant and then transfer to the port for embarkation on the overnight ferry to Athens departing at 11.55pm. Overnight stay will be on board. At 8am we will arrive in Athens where we will meet the local representative and transfer to a nearby hotel to enjoy a buffet breakfast and say our goodbyes to our fellow travelers who are not returning home on the group flight. After breakfast, we'll transfer to Athens International Airport for a departure flight back home departing at 1.20pm. Our Qatar Airways flight lands back in Melbourne at 5.50pm and Sydney at 5.35pm. Emirates economy class passengers can check in 30kg of baggage & are permitted one piece of carry-on baggage that may not exceed 22 x 15 x 8 inches (55 x 38 x 20cm) & must weigh no more than 7kg. An excess will be charged for any baggage over these limits.